Saw - Hand, table, or miter will work. 1 24" Vinyl Stencil - email me and I can have it shipped it to you. 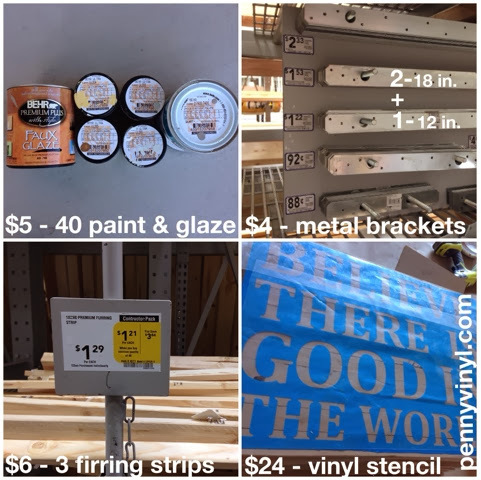 1 • buy three furring strips, which are 2x1x96", to make one 18x24" sign. • push them them up against a flat surface. It makes it easy to measure and mark them all in 24" segments simultaneously. 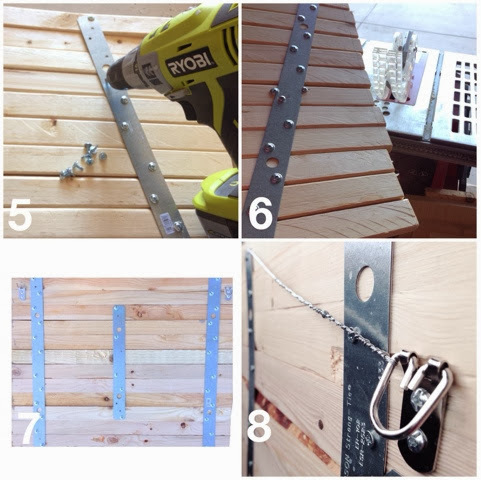 2 • cut straight across each board with a hand or miter saw (you'll end up with 12 pieces). 3 • lay boards next to one another. 4 • align boards so that one side is straight. 6 • since you've already aligned one side you'll only have to clean up one side of the boards. Drawing a straight line makes it easier to run through a table saw so both sides are straight. 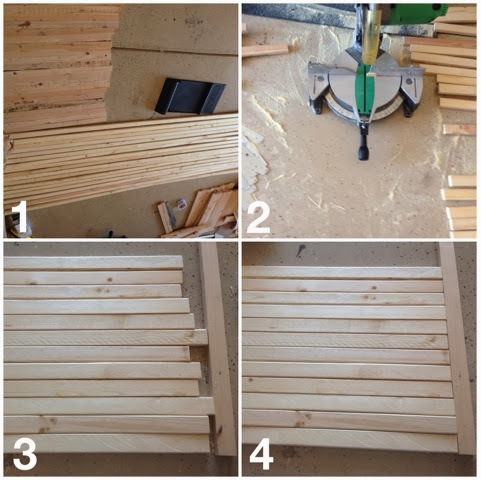 If you'd rather not or don't have a table saw just make sure each piece is exactly 24" long. I made one with each piece slightly different in length it added a rustic, "found" flair. As you can see I secured a board that was warped with a couple extra screws on each side to anchor it to the bracket and keep it stable. 7 • this is what the hardware looked like on some that had wider furring strips, others had more narrow strips so I had to angle the brackets inward. 8 • I used the double holed mounting hardware so the brackets seemed a little more stable and didn't twist... though a single would be fine. They run around $2-4 at any hardware/craft store. I then ran hanging wire through a few times and twisted it tight. Leveling and hanging pieces from two mounts is too tedious and unforgiving. "AIN'T NOBODY GOT TIME FOR THAT" hence the use of wire 'cause it's self leveling and more adjustable. 9 • I painted the base a grayish color. 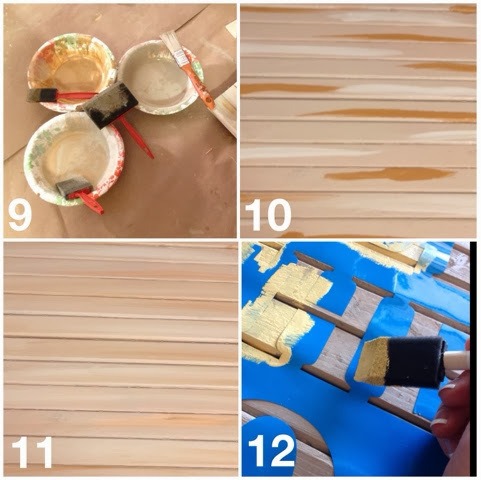 11 • I blended them all together with a wide brush by running it side to side until it reminded me of weathered wood with a patina of natural color variations. 12 • I transferred the vinyl stencil into the wood using the supplied clear transfer tape which aids in aligning & centering the text. I LOVE using the vinyl stencil as it's adhesive makes it harder for paint to seep through thus blurring the text. You can order this by emailing me at orders (at) pennyvinyl.com. Below are the photos of the colors I chose, as well as exact prices or estimates that you can buy everything for. Click on image to see detail. 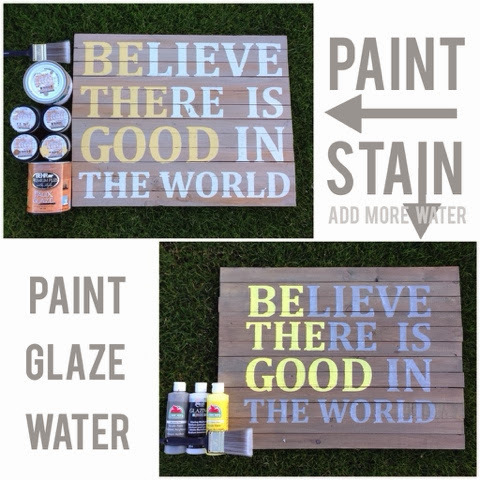 Tip: To make more of a stained piece rather than a painted one add more water than paint. I always used equal parts water and glaze. 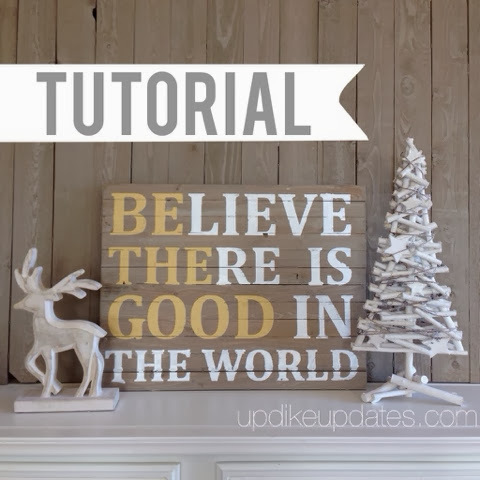 If you've been eyein' this saying as long as I have, hopefully this will help you finally get this inspiration into your life and home. I just made this up as I went along, after falling in love with a picture that inspired this creation. So if I forgot to mention or explain something just ask. I'd be happy to answer any questions!